world-changing papacy of St. John Paul II into a tapestry of wonder and beauty. And now, for the first time, Fr. Gaitley’s luminous teaching is presented with the cinematic artistry of the Augustine Institute’s film team, bringing to life the vast panorama of God’s work of mercy in the world, and his calling to the hearts of all who will embrace it. Fr. 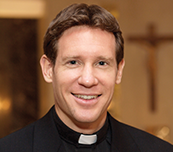 Michael E. Gaitley, MIC, is Director of Evangelization for the Marian Fathers of the Immaculate Conception and author of the bestselling books 33 Days to Morning Glory, Consoling the Heart of Jesus, and The Second Greatest Story Ever Told: Now is the Time of Mercy. Fr. Michael lives and works on Eden Hill in Stockbridge, Massachusetts, home of the National Shrine of The Divine Mercy. Excerpt from "Divine Mercy in the Second Greatest Story Ever Told"
1. What is Divine Mercy in the Second Greatest Story Ever Told? Divine Mercy in the Second Greatest Story Ever Told is a dramatic 10-session film journey featuring the renowned Fr. Michael Gaitley, MIC. With his characteristic skill and lucid style, Fr. Gaitley interweaves the dramatic history of Poland, the transformative message of St. Faustina, the miraculous appearance of Mary at Fatima, the witness of St. Maximilian Kolbe, and the world-changing papacy of St. John Paul II into a tapestry of wonder and beauty. 2. 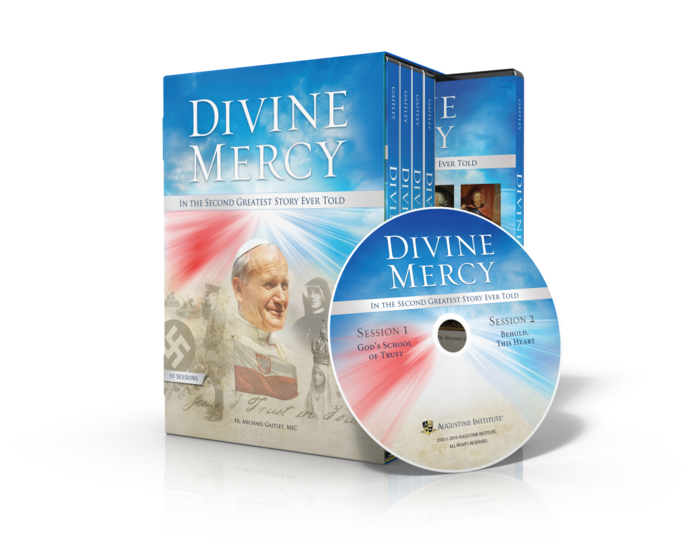 What is included in the Divine Mercy in the Second Greatest Story Ever Told DVD Set and how long is each episode? 3. What is included in the Guidebook? 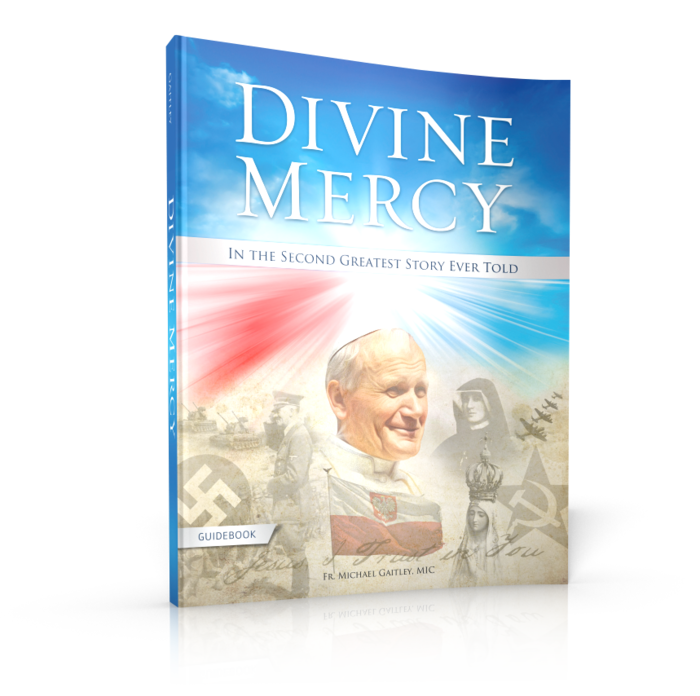 The Guidebook for Divine Mercy In The Second Greatest Story Ever Told is key to getting the full experience. 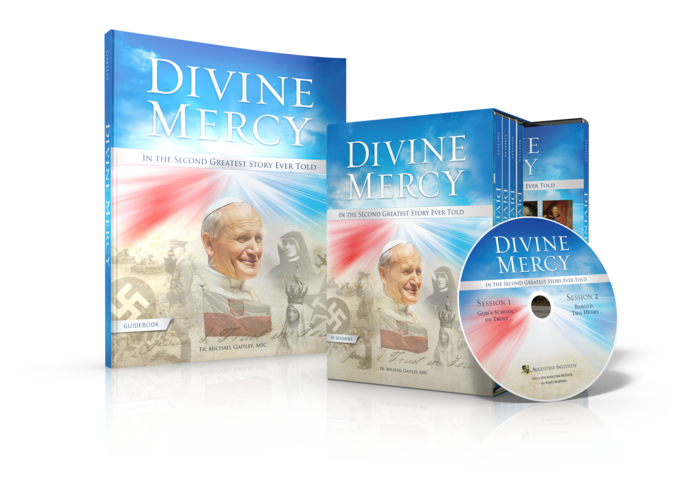 This powerful resource was created to lead you deeper into the story of Divine Mercy, and it is perfect for both Leaders and Participants as it contains the content for each. Beautifully and thoughtfully crafted, filled with stimulating graphics and imagery -- this personal study guide leads you deeper into the history, the faith, and passion surrounding Divine Mercy with over 80 pages of incredible content. 10 sessions that make the mystery of Divine Mercy clearer than ever before. An outline summary of each video presentation. Insights and information for deeper understanding. Guided reflections for each session to make the study your own throughout the week. Space for personal journaling with each session. 4. What is the pricing for Divine Mercy In The Second Greatest Story Ever Told physical product? 5. Can a parish buy digital access to Divine Mercy In The Second Greatest Story Ever Told? Divine Mercy In The Second Greatest Story Ever Told is available on FORMED.org, an online platform of the best Catholic video studies, movies, e-books and audio presentations. 6. Do the DVDs include closed captioning? 7. Is this program available in Spanish? No. We are currently working on releasing this program in Spanish, but we do not have that available at this time. 8. Are these DVDs optimized for International Use? 9. Does it have an Imprimatur? 10. Does Divine Mercy in the Second Greatest Story Ever Told have a Nihil obstat?